According to the release, Jeh Johnson was speaking on “the Obama administration’s continued commitment to build bridges to Muslim-American communities”. 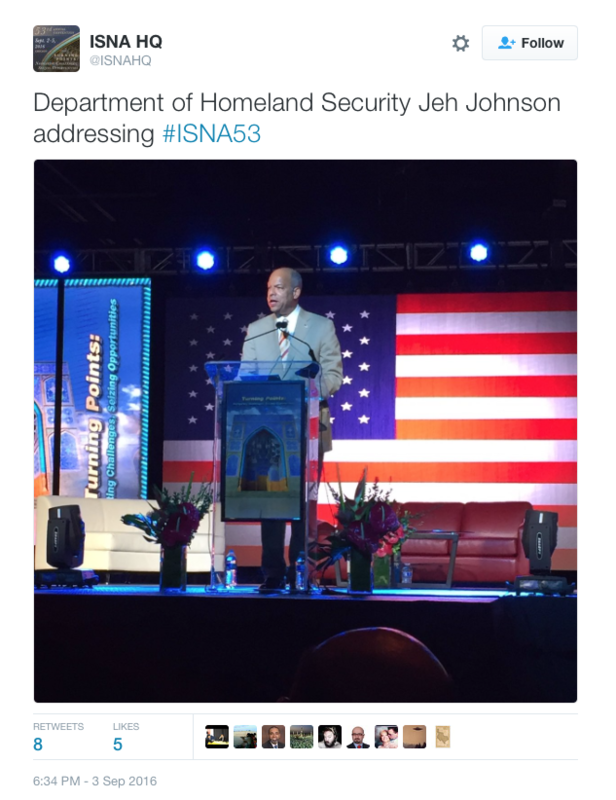 Apparently, Johnson, a Muslim and head of the Department of Homeland Security, missed the Holyland Foundation case in which ISNA held to be a Muslim Brotherhood front group and an unindicted co-conspirator in aiding Hamas. Declassified FBI memos reveal that ISNA was identified as a Brotherhood front as early as 1987. The testimony was heard at a Senate hearing of the Judiciary Subcommittee on Oversight, Agency Action, Federal Rights and Federal Courts. 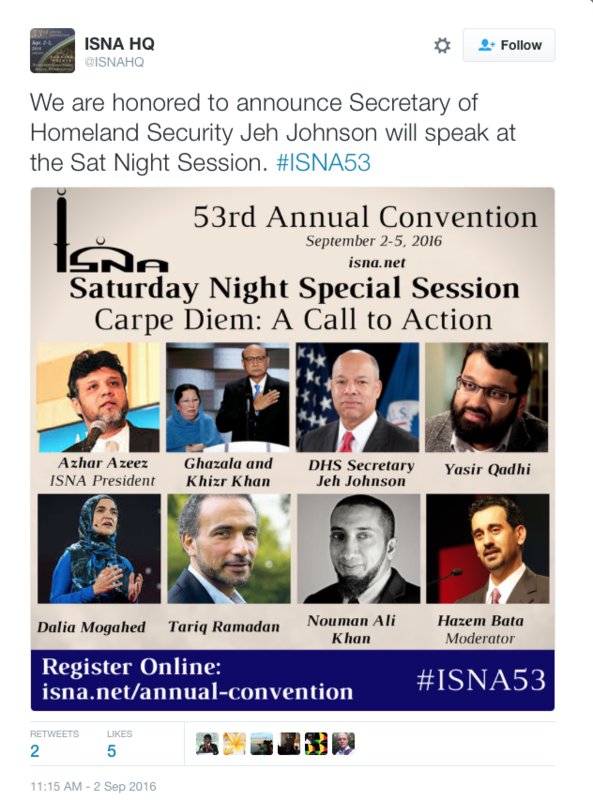 ISNA was co-founded by Muslim Brotherhood members. Documents submitted in the Holy Land Foundation trial, the largest terrorism financing trial in American history, show that ISNA sent money to senior Hamas officials during the 1980s and 1990s. Hamas has been listed by the United States as a Foreign Terrorist Organization since 1995. Hamas has openly declared that it is “a branch of the Muslim Brotherhood – Palestine,” and in fact was created as a Brotherhood offshoot. The Khans also spoke at the event. 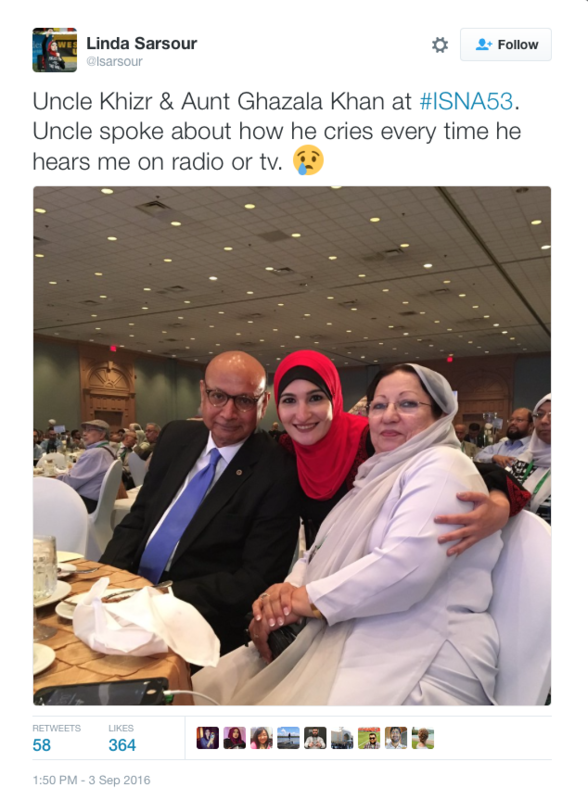 Here they are pictured with Linda Sarsour, a fixture in leftist movements like Occupy and Black Lives Matter, a ‘Palestinian and racial justice activist’, who apparently refers to the Khans as her aunt and uncle and who introduced them at the event.